Michaels and Sally's are taking omnichannel to new levels through interconnected campaigns that blend and blur the lines between media boundaries to achieve a united 360-degree presentation of messages and experiences to consumers. Be in your consumers' preferred media spaces and offer avenues for cross media interaction. In developing campaigns, have a clear path that guides and entices consumers to take your brand journey across channels. Michaels Arts & Crafts Wants "Makers"
Specialty retailer, Michaels Arts & Crafts, is creating a sense of community that guides consumers effortlessly between its bricks and mortar and digital spaces within one comprehensive marketing umbrella. Their all-encompassing marketing program, "Michaels Makers" seamlessly integrates Online and In-Store classes, summit events, and blogger outreach programs. Additionally, they use a combination of web and social to actively involve their audience in monthly online craft challenges. Crafters can also post their own projects on social media using #MadeWithMichaels for a chance to be featured on Michaels' social channels. Discussing their most recent "Makers" summit, Steve Carlotti, Michaels Executive Vice President Marketing states that "Our Michaels Makers Summit was the largest-ever craft retailer event of its kind…In our increasingly digital world, bringing these makers together face to face was powerful - we came here as individuals, but we left as a creative community." "In marketing we continued our efforts to balance our mass and personalized marketing messaging… In the last 12 months alone we have expanded our email database by more than 10%…. In March, we had our first Springtime in Paris event. We used all of our different marketing channels … we had a dedicated website for the event that received almost 400,000 visits. 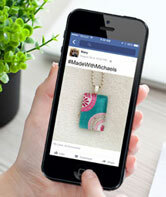 Customers also shared [via] Facebook, Pinterest, Twitter, and email. And in store we had classes…. our customers [had the] ability to [create their own art and] send us a picture to enter a drawing for a free trip to Paris. Over 11,000 entries were submitted for the contest." Sally's Is Getting Viewers Involved in its New "Project"
Sally Beauty Supply is so excited by its new association with TV show, Project Runway, that it decided to take its customers along for all the backstage fashion glitz and glamour. The company is cultivating a community with an interconnected marketing campaign that directly ties in both the looks created on the show as well as some behind the scenes "dish". Via the newly launched interconnected marketing campaign, consumers are sent email messages that reference the most recent hair and makeup looks along with the actual products used and the step by step guidance to achieve looks at home. The campaign includes email messaging, a large mix of social media, YouTube videos, plus a dedicated section of their website. Consumers can additionally enter online or in store to win the "Runway Your Way” sweepstakes for a trip to New York City to see the show’s finale. Currently Sally’s has 416,000 Facebook likes, 53,000 Twitter followers. An interconnected media strategy must include a fully rounded media mix that reflects the avenues your customers prefer. Understand where and how your customers are spending their time and then develop strategies for cross-linking action points to move them on a predicted path. If your interconnected campaign does not offer points of value, consumers will not participate. Develop meaningful ways to connect with your consumers through education; tips; "in-the-know" background info they can't get elsewhere; videos; social interaction; web involvement, etc. Encourage the feeling of community and value in your interconnected media campaign. When consumers feel that they are a part of a "movement" they are more inclined to want to participate and be a part of a true "event." Omnichannel is a proven strategy, but now is the time to take it to the next level with an integrated mix of media, messaging and experiences.